We are quickly moving through 2017, and the dividend income continues to pour in. Well … maybe not pour in yet, but it continues to increase month by month and year by year. This past month (May) was certainly no exception. We continued to invest new money into the market, which will generate future income and compound over the years. 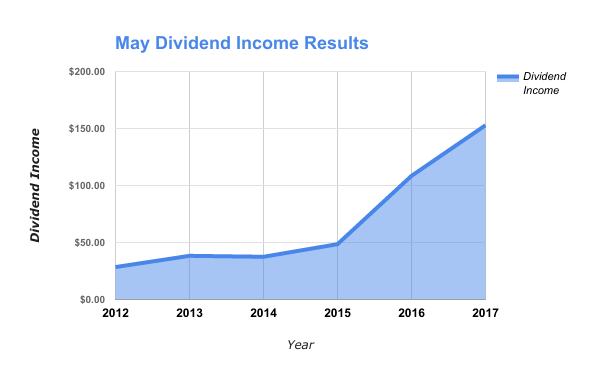 In addition, most of our dividend income earned during May was recycled back into more shares of stock … either through dividend reinvestment plans (DRiP) or through one off transactions in our Robinhood account. We were also able to boost our future income through many different company dividend increases. Getting these increases is awesome … because we didn’t have to do anything except hold onto our shares for the long term. Overall, it was a great month and another step towards building and growing this sustainable income stream. 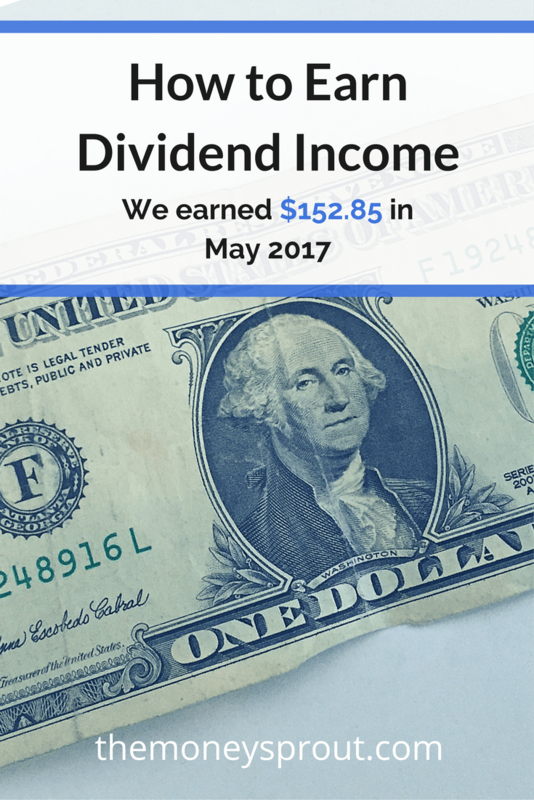 Not a huge surprise, but we set another record for May dividends. Really, unless we get a dividend cut or sell shares of a stock … we should never see any decrease when comparing months. Since we are constantly investing new money and reinvesting our dividends … our income stream should continue to grow every single month. May was no different – we continued to grow our new investments as well as our most recent dividend income earnings this past month. Month by month, year by year … we continue to slowly grow this sustainable income stream. We saw an increase of 41% last month compared to May 2016! This latest increase of over 40% is higher than past months and shows all the new capital we have invested into the market is working hard. 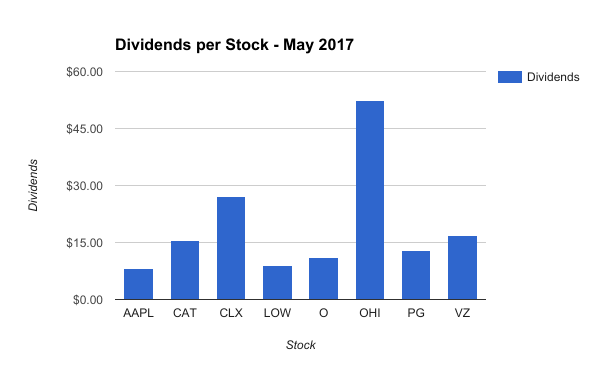 Overall, we had 8 stocks pay out a dividend in May. Awesome companies like Lowe’s, Clorox, and Procter & Gamble gave our family a paycheck for not really doing much at all. You can’t really beat that! Recent investments in Apple (AAPL) and Omega Healthcare (OHI) are a big reason for the increases over the past year. Over the past 8 months, we have been focused on growing our forward annual dividend income to $3,000 by the end of 2017. We set this goal last November (2016) and have been busy investing new money into dividend stocks ever since then. The goal requires that we invest over 25% of our income … which can be difficult during certain times of the year. That comes out to around $1,400+ per month. As you can tell below, we have been up and down with these new investments. The good news is last month (April) we invested a good chunk of our tax return, which helped bump up our investment totals. Note – All of these investments were made through our Robinhood and transfer agent (CINF) accounts … which means we did not pay any commissions or fees on these trades. 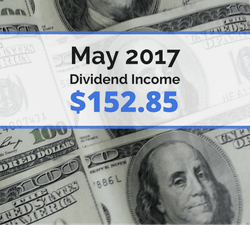 The dividend income earned in May ($152.85) was up over 40% from the same time last year. That is truly incredible that we have grown our dividend income by that much over the past 12 months! The increases were from a combination of new investments made, dividend reinvestment’s, and company dividend increases. Speaking on company dividend increases – we got several this past month – Johnson & Johnson (JNJ) 5.0%, Exxon Mobile (XOM) 2.7%, Apple (AAPL) 10.5%, Clorox (CLX) 5.0%, and Intel (INTC) 4.8%. Overall, those increases will boost our annual dividend income by $22.16! That is just awesome. Our goal for 2017 is to earn $2,400 in dividend income. We have earned a total of $863.48 in dividends for 2017 … which means we need to earn around $1,540 the remainder of the year. That is an average of $220 per month. Unlike 2016, I think reaching our goal in 2017 will be challenging but within reach. Last year, we set an unrealistic goal and didn’t come close to reaching it. As long as we keep up with our new investments, I think reaching our 2017 dividend income goals can be attained. And if all goes well, we will be on our way to reaching a goal of $3,000 in dividend income for 2018! Full Disclosure – At the time of this writing, we owned shares in the following stocks noted in this post – AAPL, CAT, CINF, CLX, CSCO, LOW, O, OHI, PG, and VZ. The material above is not a recommendation to buy. Please do your own research on a company before deciding to invest.